On a global level, our major concern at present is the plight of migrants; and here at home (at least in Ireland) the plight of the ever-increasing homeless. 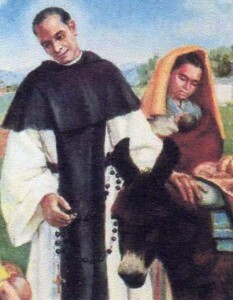 Both groups might find a patron and advocate in a neglected Dominican – St. John Macias. Have we forgotten him? Juan Macias was born to a very poor family in Spain in 1585. Orphaned when he was four, he and his younger sister were brought up by an uncle who hired out Juan as a shepherd when he was still a child. In the time spent with his sheep, he developed a love for the rosary. A casual meeting with a Dominican friar sowed a tiny seed of a wild idea that he might one day be a Dominican. A more prosperous farmer for whom he worked must have seen possibilities in the young man because he offered him a ‘pauper’s’ passage to South America. So Juan, aged about 30, set sail as a destitute migrant seeking a new and better life in the ‘New’ World. The long journey – many weeks, sometimes months – in the ships of those days was tough for everyone, conquistadores, entrepreneurs, missionaries; but it was appalling for the poor migrant, confined to the hold, half-starved and getting the very worst of everything. And when they landed safely, his problems weren’t over. He probably landed on the island of Granada, and then struggled on through present-day Venezuela, Colombia, and Ecuador before finding a place to settle in Lima, Peru. Here, he encountered the Dominicans again and became a servant at the friary before eventually entering the community and making profession as a lay-brother. His great desire was to spend time in prayer but obedience meant that he served as porter which kept him busy but meant that he was in contact with the poor who came to the friars for help. He soon became the ‘Bro. Kevin’ of Lima, providing meals for hundreds of destitute and homeless every day. In this he was helped by his companion, a donkey, who accompanied him daily on his begging rounds and carried home the donations of food. At last, perhaps to get some time for prayer, he decided the donkey could carry out this task alone. So off it went every day doing the rounds with a little sign asking for donations; if donors were tardy, a few loud ‘hee-haws’ drew attention to the need and brought prompt response. It became a very popular feature of the streets of Lima. With charming stories like this, it is amazing that Juan’s neighbour and friend, Martin de Porres, has so completely upstaged him! Amazingly, at this point in the 16th century three canonised Dominican saints lived in Lima at the same time – Martin, Rose and Juan. Even in their cults, there are subtle traces of racism. Martin is depicted as black, and I believe this contributed to the kind of affection with which people responded to him. He was not black. Rose is depicted as a ‘pretty’ white woman. She was not white. Both were mixed-race – Spanish/ African/Indigenous. Juan Macias was Spanish. John Macias has a feast day on September 18th. Roll on the promised day when we will again become familiar with our saints by celebrating their feasts.